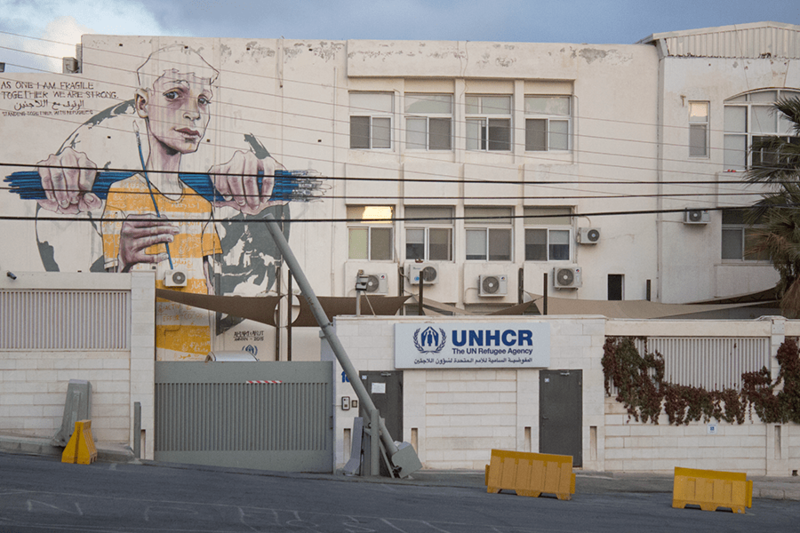 The front of one of the UN High Commission for Refugees offices in Amman, Jordan. The UNHCR is responsible for the review of thousands of refugee applications in the city. Adnan’s hair and goatee are dark gray mixed with white. When he smiles, his goatee expands across his cheeks. Like many 40-year-olds, he’s prone to wearing polo shirts and jeans. His right foot is inverted slightly. Because of it, he has a limp that gives his body a peculiar sway when he moves. 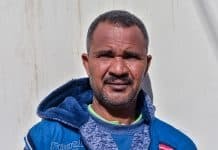 He politely declined to have his picture taken, but was more than happy to sit down and talk about his application with UNHCR for traveling under refugee status. He left Baghdad two years ago. Now he lives in the Hashemi Shamali neighborhood of Amman, where he regularly comes to programs at Collateral Repair Project. Adnan is one thousands of refugees in Amman who are patiently waiting to find out whether his UNHCR refugee application will be accepted. If so, he will hopefully be able to travel to the United States. If not, he’ll be stuck in Amman, looking for consistent employment in a city that already has a struggling infrastructure and job market from the enormous influx of refugees. Adnan is currently going through a tedious “interview process” with UNHCR. The process involves three different interviews, the spacing between each of which is, at a minimum, months apart. “There haven’t been any challenges exactly, but waiting for the whole process is such a long time. The problem is so many people are going through the same process . . . it’s about one year between each one, this past wait (between the second and third interview) has been about nine months,” he says. There are caveats beyond the UNHCR application, however. Many of them have to do with the policies for refugees in whichever country Adnan applies for, United States or otherwise. The individual’s profession may be taken into consideration. “The position I had when I worked in Iraq isn’t supposed to affect my application. 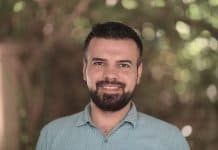 In one of the interviews I was asked and I told them I worked in a restaurant.” While profession is no concern with the UNHCR, issues such as physical evaluation, professional background, and linguistic ability do factor into whether or not certain countries will accept them. The UNHCR currently refers only one to two percent of all applicants to asylum in a third country. 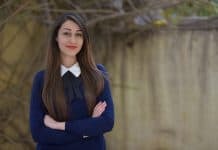 This is what makes refugee centers like CRP so necessary, to provide resources and contacts while refugees trudge through all of the lengthy bureaucracy. While the process takes multiple years for everyone looking to rejoin with family and restart their lives following the violence and economic turmoil they’ve escaped, the desired results of these applications remain out of reach for most. Nevertheless, the UNHCR application remains their only recourse. For now, all Adnan can do is wait, and try to build community for himself in Hashemi Shamali and at CRP. Donate here to help support CRP’s activities. We strive to make their time in Amman, whether it’s years or the rest of their lives, as fulfilling as possible.